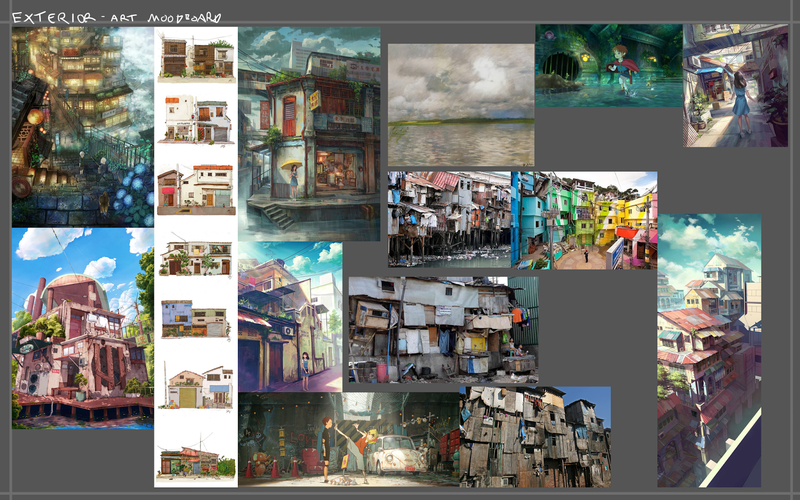 James Broderick Design Blog: FMP 6 - Paintovers! Since last week my role has shifted a little bit into doing some arty things; mainly doing paintover concepts for the exterior of the level. 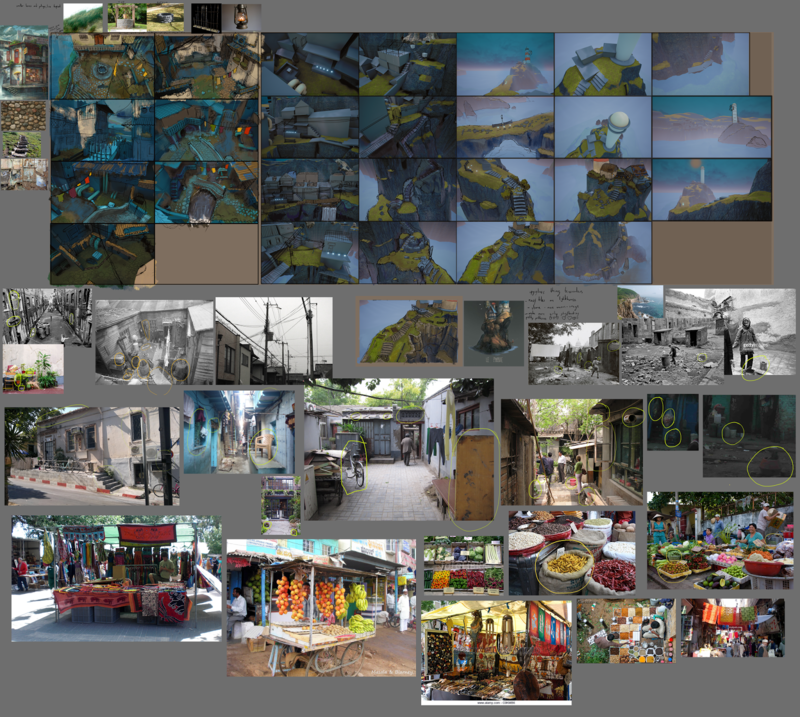 We had a few images from the start of the project that we established as mood images. The one with the girl with the Umbrella is our main mood image and represents the colour and tone we are going for the scene, the weather would be overcast so there will be a slight cold tint to everything while local colours of objects take more precedence. In terms of buildings we are looking to create a blend of european architecture and asian slums, with an emphasis on the reuse of objects within the town (upcycling). Earlier in the project I created some loose sketches of what I imagine for certain parts of the game, some of these areas have now been cut but the art direction still stands, things are covered with corrugated metal and wooden planks yet the environment is still meant to feel quite homely. This is the main paintover document, as you can see these are different angles of the level with varying levels of paintovers done to show what each area would look like. The colours needed a lot of tweaking however as I struggled a bit to get it right, I corrected some of the colours in a more polished painting to show the look of the game in a bit more depth. 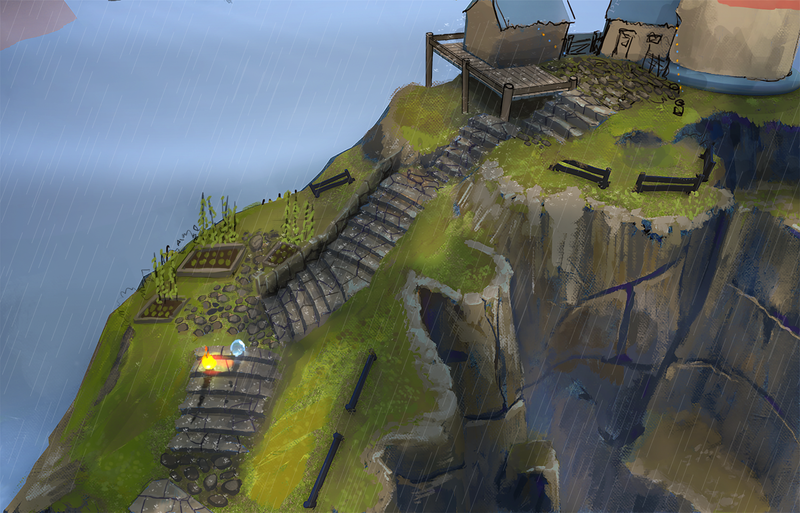 Also here I used the opportunity to circle assets that be modeled as props for the level. 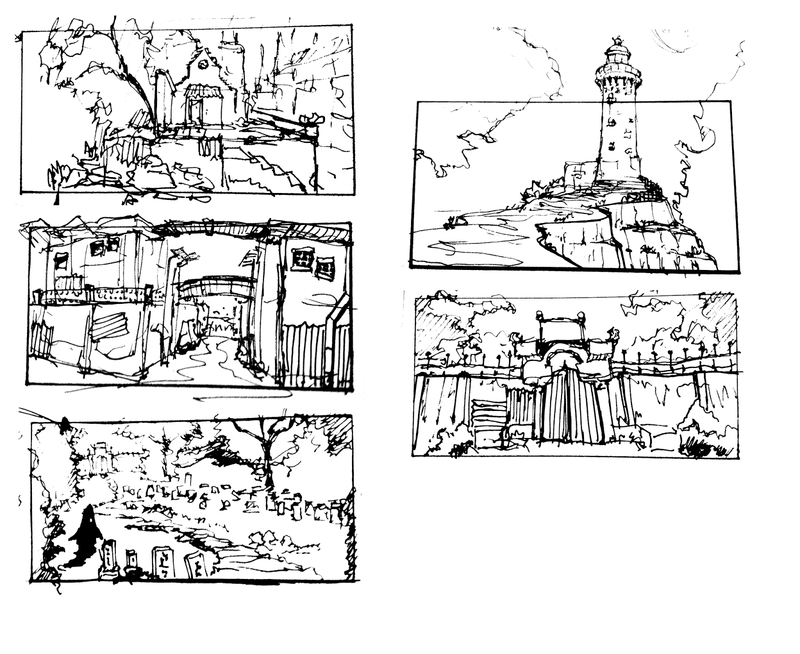 This next image contains some sketches for the lighthouse design, we wanted something that looks like it has been reinforced by other structures similar to what the town is like, the lighthouse is meant to be quite a spiritual place as well so a thought was for the lighthouse to be decorated in various patterns and shapes that could have been painted on by the owner to represent different spirits. The next image is a more polished version of one of the paintovers, this time with the colours corrected. this is used by the team to establish what the textures and some of the environment props look like as well as what the rain effect could look like when finished. 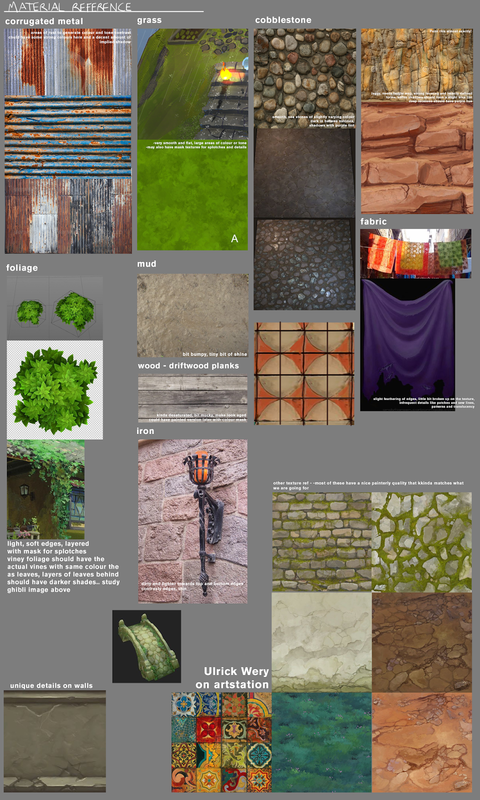 After this I produced a material breakdown that Hazrat and Amber could use while creating textures, this just helps along some of the guesswork for what things are meant to look like in our level the textures have to be stylized. Adding notes and art direction on each type of material makes it easier to ground what look we are going for even more, with refinements and changes made as we figure out whats works best.